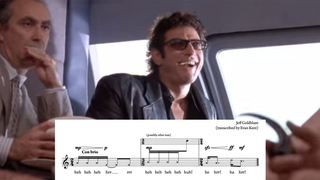 If that ridiculous song of Jeff Goldblum's unique laugh from earlier this year wasn't enough, now it's time to train our voice or take out those ukuleles, because someone made the ridiculous laugh's sheet music transcription. Piece of cake! Take note of the "con brio" direction right at the start. It means you to perform it "with spirit"!